What do the Grateful Dead and Anchor Steam Beer have in common? Both call San Francisco home, both are beloved San Francisco icons, and most importantly, both are celebrating 50 years in 2015! In 1965 San Francisco, a group of young, talented individuals came together to create music that defined a generation. 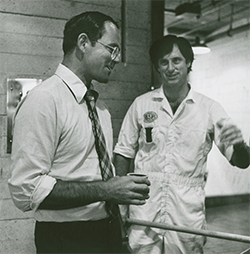 At the same time, a Stanford University grad with a beaming entrepreneurial spirit named Fritz Maytag bought a tiny, struggling brewery and started a brewing revolution. “Summer of Steam” celebrates fifty amazing years of these two icons, and in honor of this momentous occasion we’ve created a commemorative poster which highlights the Grateful Dead “Fare Thee Well” concerts taking place this summer in Chicago and the San Francisco Bay Area. The Summer of Steam poster has its own story. It was created by Wes Wilson, the legendary concert poster artist who, since the 1960’s, has been creating art for a myriad of first-class artists like Jefferson Airplane, Paul Butterfield, Muddy Waters, Otis Redding, and most appropriately, the Grateful Dead. Your next question might be, “How was Anchor Brewing lucky enough to get connected with such an important figure of the 1960’s?” Well it just so happens that Wes used to work for Anchor! So when we thought about an appropriate artist to connect Anchor Brewing and the Grateful Dead, the solution was a no-brainer. 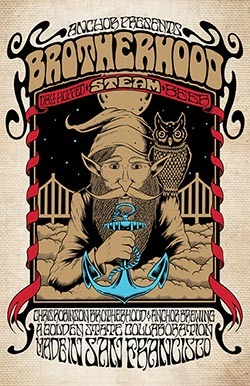 The goal of the poster was to celebrate the connection that Anchor Steam has with San Francisco, and bring that celebration to the cities of the Grateful Dead shows (Santa Clara, CA and Chicago, IL). The dates of 1965 and 2015 at the top of the poster highlight the fifty-year anniversary of Fritz Maytag’s acquisition of the Anchor brewery. In fact, the exact date of purchase can be found if you look closely at the poster: August 2, 1965 (Hint: it’s on the van). It has been a few years since Wes worked at Anchor—a few decades actually. As much as Wes revered Anchor and its authentic process of brewing, he decided to pursue his passion for producing groundbreaking art. While some time has passed since Wes’ time with Anchor, connections with Anchor don’t fade away so easily. So when we proposed that our Brew Master, Mark Carpenter, and Wes reconnect for a conversation to talk about the good ol’ days, they both jumped at the chance. 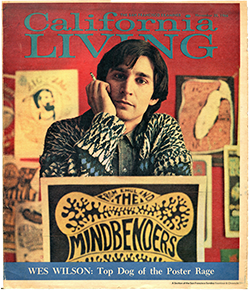 Below is a conversation between two San Franciscan pioneers: Mark Carpenter and Wes Wilson. Wes Wilson today. 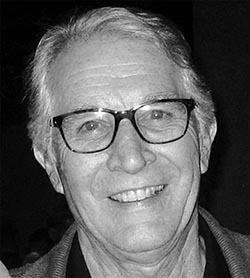 Chuck Holloway photo. WES: Mark! How are you doing these days? MARK: I’m doing great! I live very near Petaluma [in Northern California]. We moved from the town of Lagunitas to outside Petaluma in 1982. WES: So you lived out in Lagunitas. MARK: Yeah, remember we used to meet up down in Specs? WES: Oh my gosh, you’re right! MARK: I never hung out there much. Once Specs burned down, it was shortly after that that we moved away. Q: Wes, you worked for a time at Anchor, correct? WES: Yes I did! I was doing work for Time Magazine and Life Magazine and I didn’t want to work at a large agency, so I decided to become a carpenter for a while. That was about the time that Fritz convinced me to come work. MARK: How did you meet Fritz? WES: Well I met a guy who knew Fritz, and I did some artwork for his book. I met Fritz through him and I had a glass artwork idea which Fritz liked, and eventually I got to working in my spare time on the bottling line at the brewery, loading bottles into the bottle rinser. That was fun. MARK: Yeah, that’s where I first met you, working on the bottling line. WES: I used to leave to work at the brewery around 5:30 in the morning from Lagunitas to get across the Golden Gate Bridge before traffic got too bad. MARK: Well you wouldn’t believe the traffic here today, buddy! WES: Doesn’t that new BART system help? MARK:: It helps a lot, but this area is so popular now Wes. It’s just unbelievable. WES: My grandfather was actually born there. I lived there for eight years, and moved away. I live in Missouri now but I still consider San Francisco my city. Q: Wes, what year were you at Anchor? WES: Ooh, let’s see. ‘69, ‘70. Something like that. 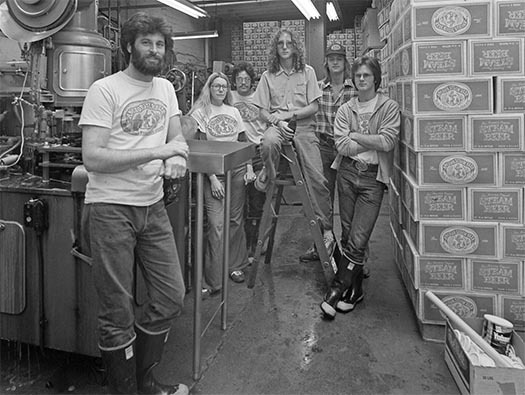 MARK: ‘71 is when we started bottling, so it would’ve been ‘71. WES: Yeah, you’re right. Probably ‘71, ‘72 then because I worked in bottling. But I think I skipped around, working here and there. MARK: Yeah, in those days we didn’t bottle much. Q: Wes, what were your fondest memories of the brewery? WES: What I remember most were the incredible kettles that were used to brew the beer. And you could open a door to them and see all the mash and hops boiling away. Those things were really neat because they were all copper. I just liked to look around at everything and see how shiny and clean everything was. I loved how precise everything was with the ingredients and the process. It was like an art. MARK: I think what caused me to fall in love with the brewery initially, was the wonderful brewhouse. Fritz really did a fabulous job with that. And he created a whole industry! 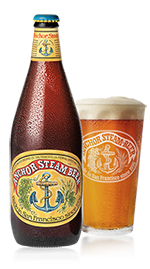 WES: I think Anchor Steam was the first unusual beer that I remember back then. There was the common stuff like Acme, Budweiser, Lucky, and then there was Anchor Steam, which was totally different. MARK: It was! At that time there were somewhere around 100 total breweries in the US. And right now there are over 3400 breweries! You probably have a brew pub within a few miles of your place in Missouri! WES: Yes, in fact one of my favorite breweries around here is in Aurora, where a man had bought an old bank and put the brewing equipment inside the bank vault! Q: What were your impressions of Fritz? WES: Fritz, oh gosh. I really like Fritz. He’s a wonderful guy. He’s got a mind for detail. He loves the idea of doing things by hand and I really admired that. He had all these projects going on all the time…We had a mutual friend, Chet (Helms) from Family Dog. And Fritz liked that bohemian art world. He had that collegiate appreciation for that crowd, where you get out of college and the world is your oyster, and you’re going to go out into the world and do it. MARK: He was an amazing guy. He had such a clear, long vision of what he wanted to do [with Anchor]. Q: Wes, what kind of art were you involved in while working at Anchor? WES: By ‘71, ‘72 I had done quite a few posters for Bill [Graham] at the Avalon Ballroom, and I started also making posters for Family Dog and Chet Helms, which was kind of a different type of poster. MARK: Before Wes’s designs, which included the Avalon Ballroom designs, the rock poster—or music poster—was a standard format. It was almost like a rainbow color with block letters, just saying who was going to appear where. And Wes really created an unbelievable style that was completely different. He, along with a couple others did some unbelievably good posters. So many of Wes’, you’d have to study to be able to read them! WES: Haha! Yeah, I got the hang of that lettering alright! MARK: And it really was a fabulous time. If you went to the Fillmore, when you were leaving at the end of the night, they would hand out a postcard sized version of the poster. And they were great—I used to love using those as post cards to send to friends. It was really pretty cool times. WES: They also gave posters out for quite a while even before the postcards…And some of the posters along with paintings I made back then, I’ve been able to reproduce which has been a lot of fun. MARK: You know Wes, back at the old days at the brewery, you gave me a poster that you had signed. And it still hangs in my house! MARK: Wes, you may or may not know the back story to the poster that you created for us, but it came about because we did artwork for a beer here [Brotherhood Steam] and the artwork looked very much like your artwork. I think the artist really was drawing on some of your stuff. And then I had to give an interview and they asked me what I thought of the artwork on the can. I said I loved it because it reminded me so much of Wes Wilson’s work, who used to work at the brewery from time to time. And then we thought, oh great, if we could get a hold of Wes, that would really be cool! WES: Oh, that’s great! Well lately I’ve been doing a lot of artwork in fact. By and large, I just keep on truckin’ with this stuff! In fact I just did the cover of an issue of Rolling Stone for the Grateful Dead! Q: Wes, could you tell us about your ideas for creating the poster? WES: Well I thought the guys going to Chicago in a Volkswagon-type bus was a great idea because, well you know, coming from San Francisco, it has to be “Chicago or Bust,” to go celebrate the Grateful Dead. So the idea is to show a group of people going off to enjoy themselves and celebrate. And the letter styling I used was a bit of a recreation of another poster I did for Family Dog with Jefferson Airplane and Big Brother and the Holding Company. Q: Mark, do you have any personal experience with the Grateful Dead/San Francisco music scene? MARK: I would certainly spend a lot of time going to the Fillmore and the Avalon, and we would go to see the Grateful Dead a number of times, but I didn’t know them personally. In those days, there was so much good music in San Francisco, you had the Avalon Ballroom and the Fillmore Auditorium and they all ran Thursday, Friday, Saturday, Sunday. And if you went Thursday or Sunday, you didn’t have the big weekend crowds there and you had this great music, it was just amazing times. Name any band of that era and they appeared there and we saw them! WES: You could go to these concerts and I think the lowest ticket price was around $2.50 and there would often be three bands, which I would create posters for. Usually one blues guy like say, Lightnin’ Hopkins. Then there’d be someone like say, the Quicksilver Messenger Service. And then maybe one night there would be The Doors! 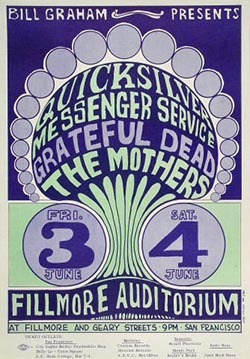 I remember doing one poster where the Quicksilver Messenger Service was on top, the Grateful Dead was second, and then the Mothers of Invention were third! And the whole thing was just two dollars! 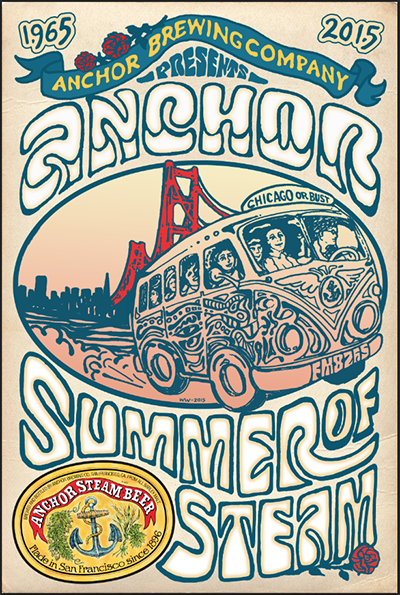 As the “Fare The Well” Grateful Dead shows take place in the San Francisco Bay Area and Chicago over the next two weeks, we hope you’ll join us in celebrating the Summer of Steam by raising an Anchor to 50 years of American musical and brewing tradition. I was born here in S.F. in ’65 too!